Indicated for the elimination of rats, mice, cockroaches, thumbtacks and small reptiles, without using chemical products. Both versatile and economic, the carton trap of glue, it is designed to catch in most typical household rodents such as the mouse. - The table adherent of Catchmaster can be used in horinzontal, or also folded in a rectangle in order that is more discreet. - Also, it is possible to use this trap, being very useful to catch "creepy-crawlies", as cockroaches, thumbtacks or spiders and reptiles of small size, which in occasions appear in our home. - It can be used glue tube Catchmaster to increase its effectiveness, is acquired in spare parts section. 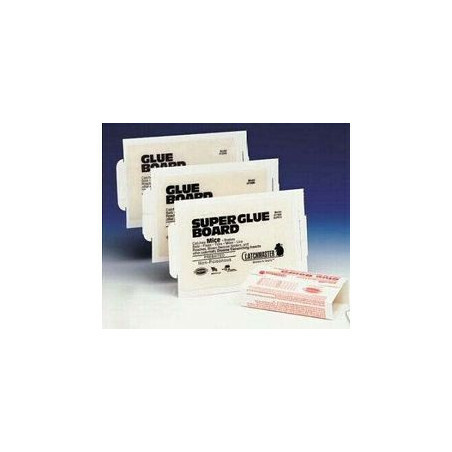 - Support of rigid carton with glue, not toxic, not colorless and not inflammable , which it incorporates foodstuffs appealing for the apprehension of mice. - It Allows his utilization of form flat or turned into station of fattening. - Indicated for establishments where the utilization of chemical products is restricted. - Package of a one unit. - His dimensions are: 21,6x13,4cm. - Of easy placement, it is recommended to use in the zones of step or where we detect the presence of mice. - For to reject the captured mice, it will be eliminated by the trap, it is preferable to realize it with gloves not to touch to the mice.